Ford, Chevrolet, and Chrysler sold 1103 Mustangs, Camaros, and Challengers in April 2013. More than half of those 1103 sales occurred in Ford showrooms, where Mustang sales are only down 1% this year. Camaro sales have tumbled 36% – Camaro sales were down 16% at this time last year. Dodge Challenger sales rose slightly in April but are down 13% in the first four months of 2013. A year ago, Challenger sales were down 26%. The trio of American muscle cars aren’t the only rear-wheel-drive coupes to post fast-falling sales in 2013. The Chevrolet Corvette, now in a replacement phase, is down 42% this year. Hyundai Genesis Coupe sales are down 26%. Sales of the Nissan 370Z have plunged 35%. Japan’s two newest rear-wheel-drive coupes – twins from Scion and Subaru – don’t have enough history to form year-over-year comparisons. But Subaru reported its best BRZ sales month yet, and Scion FR-S volume reached its highest volume since July of last year. Germany produces its fair share of rear-wheel-drive cars, and while the sales figures for some coupes are wrapped up in their overarching nameplate’s total (3-Series, C-Class, E-Class), two-seaters from Porsche, Mercedes-Benz, and BMW generated 173 sales in April. The all-wheel-drive Audi TT outsold the Cayman, SLK, and Z4. 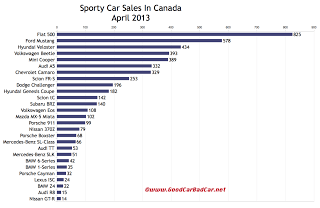 You can click any model name in the tables below to find historical monthly and yearly Canadian sales data. You can also select a make and model at GCBC’s Sales Stats page. 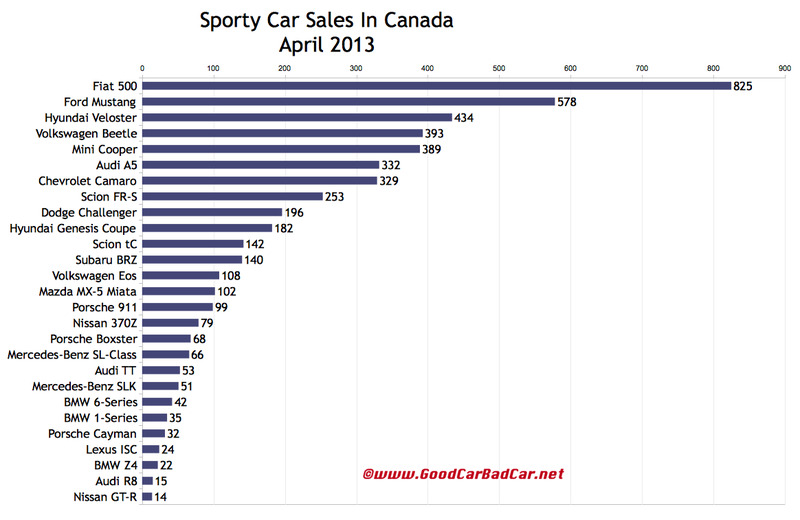 These tables are now sortable, so you can rank Canadian sporty cars any which way you like. Suggestions on how GCBC should break down segments can be passed on through the Contact page.